Kate Used: Gouache, watercolour, acrylic pen, ink, charcoal, and glitter. ISSUE 1 ONCE UPON A TIME FEATURE WRITERS Alicia Schultz, Ashley Rodgers, Julia Cusworth, Katie Smith, Lauren Blood, Lauren Hooper, Misty Granade, Riet Poch, Sasha Zinevych, Tanyalee Kahler. Flowers are nature’s form of art: the vibrant and soft colours, the beautiful lines, the imperfections. Yet, their beauty is fleeting. They take your breath away only to fade a short time later. They are temporary, and once a particular type of flower has finished blooming, you wait another year to see them again. For me, the passing of time is quick when keeping track with each blooming flower. I have this desire to take the ephemeral beauty and make it a little less temporary. WHY FLOWERS? My love for painting, drawing, and making art with flowers stems from spring. I have lived in places with distinct winters, where everything living fades away and the weather turns cold and brown. Flowers have always been a sign of life, hope, and of spring and summer coming. When I lived in New York City, they turned the cold, gray, concrete, building-filled city into something alive again. I’d walk blocks out of the way to see the magnolias blooming, which were some of the first signs of the changing of seasons. Flowers are nature’s form of art: the vibrant and soft colours, the beautiful lines, the imperfections. ART JOURNAL ART SHOW Last spring, I participated in an art show in Portland, Oregon, USA. The show was curated by a poet named Ash Good and opened with the release of her new poetry book called These Things Will Never Happen Quite Like That Again. The show’s theme, inspired by a poem in her book, was My Grandmother’s Grandmother’s Great Grandmother Sings With Me. It explored female ancestors, generations of makers, resourceful women, changes. From this theme, I kept coming back to flowers. They are feminine. They are often grown by the hard work of so many women, including many women in my family: my mothers, my grandmothers, my great grandmothers. I chose the king protea for my piece because it represents change and transformation. Generations of women have transformed to this point in time, where I exist as a piece of each one of them, and a piece of myself. When I sat down to make my art, I couldn’t paint it on a panel. It didn’t feel like me; it didn’t inspire and excite me. I am more inspired to paint in an art journal, where I hide more than just the painting. I created a handmade journal, a rather simple little book of kraft paper stitched together. I only included three spreads plus a cover; although only one spread would actually be visible once it was framed. With the women of my past and the women of my future, the ones that would consider me their ancestors someday, in the front of my mind, I created this art journal. I hand lettered words and experimented with ideas in this art journal, and I, of course, painted the king protea. I had the art journal framed using a spacer between the glass and the art journal to give the journal space within the frame, with the art journal opened to the king protea spread. I chose the king protea for my piece because it represents change and transformation. I often explore flowers in my art journal, especially when I‘m feeling uninspired. I want to share some floral art journaling exercises for you to try in your own art journaling practices. In each of these exercises, you will need flower inspiration: an image, a photograph, an actual flower. If I don’t have my own photographs or actual flowers, I will often use Flickr images without copyright restrictions, public domain images, or vintage floral plate images. COLOUR BLOCKING FLORALS Referencing your floral inspiration, use a pencil to lightly sketch out the general shape of the flower and petals. Now look closer at your flower and see how you can block out the colours. Sketch those lines in with your pencil. Don‘t be too detailed; you should only be using a few colours on this piece. This sketch will be a loose guide for the colour blocking as you paint this flower. Pick your colours for the flower including some white and black for creating tints and shades. Start with the back layer and add the colour blocks to the front. Finish by adding a background with your choice of medium. ABSTRACT FLOWERS Pick out your colours of paint inspired by the colours of your floral inspiration. Begin with a flat brush that isn’t too small and loosely create the flowers with your brush strokes. This is not a real life depiction of the flowers, but instead, an exercise where you let the flower inspire your brush movements freely. Once you’ve created the flowers, fill in the background spaces (if there are any) with a colour that will compliment the flowers. Once the paint is dried, add in leaves using paint, coloured pencils, pastels, paint markers, or whatever you choose. Make them loose and scribbled. Using your floral inspiration as a reference, keep your eyes on the flowers and your waterproof pen on your art journal as you trace the lines of the flowers on the paper. Expect it to be a mess! (You aren’t actually looking at what you are drawing after all!) Once you are done, you can now add colour. Use paint or various media to fill in the messy line drawn flowers to complete your floral art journal spread of imperfection and beauty. LINE DRAWN VINTAGE FLORALS Find an image of vintage floral prints to inspire this piece (my favorites are dahlias and peonies). Flickr or google search will come up with some inspiring options of floral prints from the 1800s or early 1900s. Start with a pencil and do a little journaling where you will eventually put your flower. Use a waterproof pen to draw the outline of the flower from your reference image. Again, perfection isn’t necessary here. Once you have the flower drawn, pick a 3-4 similar colours to paint the flower. Use varying colours on the petals. Mix colours to create even more colour options. Once you are done, choose a coloured pencil of an opposite colour and colour in some of the background. In all of these exercises, you can add in other elements of art journaling as well: hidden journaling, collage backgrounds, quotes or words, and anything else that will make it your own unique art journal spread! Alicia has generously provided our readers with some FREE DOWNLOADABLE ARTWORK to use in your own journals. The page on the right can be downloaded from the Brush Magazine website (www.brushmag.com/issueone/florals). Enter the password FLORALS (in all uppercase) to access your free download. Alicia is an artist living in Portland, Oregon, USA. She lost her fear of making ugly art shortly after her oldest daughter was born, and since then, has been making almost daily. She art journals, hand letters, paints, draws, creates stationery, and experiments with anything that interests her! She has also recently started teaching art journaling workshops. Alicia is a full time mama to two little girls (4 years old and 1 year old), but makes art as often as she can despite how busy motherhood is. Today, I want to tackle the problem I have heard many times from hurting makers: my significant other/family does not want me to create. They don’t understand, they think it’s dumb, useless, expensive, selfish, and worst of all: ugly. Not everyone, many of us encounter in this life, is going to be open, nurturing, curious and encouraging of art and our interests. Most times in life these people are acquaintances that we can distance ourselves from and/or close the artistic side of ourselves off from for the necessity of self-preservation. If this is possible for these more peripheral relationship in your life, I encourage you to do so. Create boundaries and decide who your art is for, then use these standards to protect yourself. Do not knowingly set yourself up for hurt, allow art to be a part of the life giving portion of your days. Hi Maker, I’m Lauren, the cofounder of Get Messy and a licensed marriage and family therapist. The culmination of these two provides me with a unique perspective and insight into this inspiring, encouraging and healing world of art journaling as I see it from the viewpoint of a maker and as a helper. Therapists, social workers, counselors, etc are helpers, facilitators, mediators, guiding voices, encouragers and listeners, but not magicians. One thing I have come to appreciate from my work, and the work of other counselor types is the commitment to empathy, listening and the sharing of simple, tangible steps to help you move towards a goal. With that said, welcome to my column in this incredible magazine! My aim is to help you tackle issues, big and little, that come from the intersection of being a human living in a social world and being a maker. But, what to do when your closest relationships not only do not understand, but outwardly express their desire for you to stop creating? This is where I pause to tell you that seeking the support of a counselor is a great, healthy step in any relationship. You should follow up with a professional in your area if you feel that this is a larger problem that cannot be solved with the simple tips outlined below and this problem is affecting your relationship, health and/or mental health and well being. When your chosen partner, the people who are your closest, most treasured relationships serve up hurtful comments and unfair requests, you can begin closing in on yourself, lashing out at others and can begin to feel that suffocating crush of the repression of yourself and your desires. This is not a healthy or fun place to be in for anyone, and we should work to open that door and let some light in when we find ourselves in these times. So, how to do this? It’s important to note that you did not marry this person after one conversation with them, but spent time getting to know, understand and fall in love with them. Therefore they will not agree to marry your art hobby after one conversation either, but you must help them court your passion to also see what you see or, in the least, can come to a peaceful place of cohabitation with it. So, be patient, create a plan and be prepared to give some grace to eventually find a more level place for you to meet. Elizabeth Gilbert tells us in Big Magic to have a love affair with our work, sneak in time with it the way you would a lover. I advise you to start here. Whether your spouse thinks your art will take too much of your time, money or space away from the relationship, start where that doesn’t happen. Keep a small travel art kit in your purse. Work in your car in the pick up line, while waiting, on your lunch break; find small bits of time and steal them away for yourself - give up Instagram scrolling and Facebook stalking, gift yourself your own time back. Find ways to work for five minutes at a time, don’t believe the lie that you have to have hours of uninterrupted time and a dedicated space to create. Next, have a conversation. Find a calm moment, share your art with this person and say simply: this makes me happy, it encourages me to be more creative in other areas of my life, you don’t have to like it, this is a fun hobby for me. Be sure to share from your heart and from your perspective. Accusing, harsh, pointed words only set others on the defense. Don’t ambush or overwhelm this person, but invite them to ask questions and better understand your desires and needs. Ask them what worries them about this hobby and how can you, together, find ways to address those concerns. Maybe it’s setting a budget, time limit, space limit, etc. Be flexible and answer their questions with genuine kindness, not annoyance at their ignorance or requests. Lastly, negotiate. Do they watch sports, work on cars, play an instrument, go running? All of these are things you can accompany them to and can work on your art on the sidelines, just like you would if you were reading a book. Find a way for you to still be together, but both be enjoying your time. Maybe you need to agree to a hobby time swap. You take the kids and give them their hobby time for an hour, then you switch. Helping your family make the connection from their hobbies to yours can work wonders. When you speak someone else’s language and empathise with their needs barriers can begin to fall quickly. Lauren is an American living in the UAE with her husband. She is an adventurer, crafter and storyteller. She founded Get Messy Art Journal with her internet BFF to connect makers all over the world to provide community and inspiration because making things is good for our soul. Could our younger selves have a lot to teach us when it comes to this thing called creativity? Why is play important even for adults, and how could taking play seriously make us better artists? Throughout our lives, play helps to lay the foundations for important creative skills such as imagination, problem-solving and experimentation. Children use play to express their emotions and explore the world around them. In fact, play is considered to be so crucial to a child’s development that it is protected as a human right. However as we get older play tends to get sidelined and is sometimes even considered frivolous or self-indulgent. As we balance the demands of adult life, opportunities to play can become scarce, and pressure to be constantly productive means that even our precious free time can become filled with obligations. Play might also feel vulnerable and uncomfortable to many adults who are not used to being beginners or to surrendering control over a situation. These barriers to play are understandable but surprising when you consider that play could actually be an easy, quick and free antidote to many adult stresses. In fact, allowing ourselves pockets of time to play might actually enhance our productivity. As I was writing recently I hit a creative block, so I let myself take a short art journaling break. For 15 minutes I lost myself in a world of ink and watercolours and when I sat back down to write, my brain felt refreshed and full of possibility. This is an example of what the brilliantly named and renowned psychologist Csikszentmihalyi calls ‘flow’, a state of mind in which you are so absorbed in an activity that you forget the world around you. This is similar to the state that children reach when they are deeply absorbed in playing and has been found to have natural antidepressant properties. Have you experienced ‘flow’ recently? How did it feel? It is clear that play has many psychological benefits; however the true essence of play cannot be quantified by outcomes alone. I believe that the real magic of play can only be felt by giving it a go yourself. When did you last give yourself time and space to simply play? Do you experience any negative beliefs about or barriers to play? How could you begin to dismantle these? For me, art journaling has been a powerful way of reintroducing play into my life. A blank sketchbook is like a playground for my imagination and is somewhere I can try new things without fear or shame. If I try a technique that goes unexpectedly wrong, I can paint over it, cover it with collage, rip it out or simply turn the page for a fresh start. Because an art journal is an ongoing and evolving piece of work, there is less pressure to produce a perfect finished piece. Art journaling gives me a chance to experiment and take creative risks, overcoming perfectionism as I learn that it is OK to make mistakes. Art journaling has taught me that play is really a mind-set rather than an action. It is a way of looking at things with curiosity, seeking new ideas or reworking old materials in new ways. It is also about taking joy in the creative process and valuing the act of creation itself, rather than focusing on the outcome. Sometimes play can result in the most unexpectedly profound or beautiful artwork, but often our creative risks do not turn out as we had hoped! Can we reframe our view of art, so that the joy of creating is considered just as worthy as what we see on the page? Allowing ourselves to play is a radical act of choosing joy over shame, obligation and fear. So how can we commit to play in our creative practice? Play is inherently woven into the art journaling process so maybe all we need to do is tune into it at each stage. You could use play to gather inspiration for your art - going on a micro-adventure on your way home, taking photos of happily accidental colour combinations that you love and want to capture in your journal later. These little moments of joy and play in our daily lives can give us energy that we can harness in our journals. You could also be playful when choosing materials to use in your journal. You could beg / borrow / steal some glitter from the kids in your life, or buy some gorgeous shimmering paint just because you feel drawn to it. Maybe you could crack out those old oil pastels that you haven’t used in years. Play doesn’t necessarily mean that we need new materials, it’s about the way and the spirit in which we choose to use them. And most of all, I hope you’ll embrace the spirit of play as you sit down to make your art. To be curious and wonder ‘what if?’. To rip and tear, crinkle, crunch, splatter paint and drizzle ink. To be pleasantly surprised. To laugh off mistakes and lean into the joy of creating. What could you make? Maybe you’ll love what you see on the page or maybe its beauty won’t be apparent at first. I hope that it’s in your heart that you’ll feel the real power of play. ART PROMPTS 1 2 Which art materials did you love to use as a child? Glitter, stickers, stamps, gel pens? Try adding these into your art journal. Lauren is an art journaler who is passionate about the intersection of art and mental health. She's a colour addict and her art journals are mini mood boards of her emotions and experiences. You'll find her taking pictures of flowers, visiting as many coffee shops as possible and eating strawberry laces in London. Is there an activity that you loved as a child but haven’t done in a while? Trampolining, building a den, flying a kite? Give yourself 10 minutes to try this activity and then make an art journal page based on your experience. Liberate yourself from fear of mistakes by starting your page with a deliberate one. Rip the page, burn it, pour ink over it, scribble across it. Then make your art around it. What beauty can come from this ‘mistake’? In 2016, after being involved in the art journaling world for a while, I decided to start a daily art journal. I had seen Project Life, Week in the Life and other forms of documentation but nothing really appealed to me. It was either too constricted and neat, or too fleeting - I had a desire to really document every day; from small to massive events. I am not a diary keeper really, but thought that keeping one in an artistic format might help me process some of my emotions, as well as having something to look back on for years to come. I had seen images, specifically on Pinterest, that I related to. That I felt my art could be similar too, and that is where the idea came from. I didn’t like the idea of using photographs in my art journal - I wanted this to be a place of found ephemera, rough sketches, patterns, colours and words. I decided to use a Moleskine diary. Mainly because the pages were dated and the format was a perfect size in between too big and small. The first year in the Moleskine (2016) was successful so I bought the same type for 2017. The only problem is, come winter the journal is very, very fat and creating pages can be more challenging. I’ve had to make smaller pages or collages to stick in and can see the same happening again this year! Although the idea and premise is a daily journal - I don't actually work in it every day. I know that the pressure and commitment of telling myself I have to create in it every single day (that is unattainable with a work, home and social life along with traveling, sick days and just sometimes not wanting to) would be too much and I would “fail” almost as soon as I started. Instead, I try to look in it often, work in it when I feel ready and willing, as well as using it as a place to jot down things. If something has happened but I don't have time to work in the journal, I’ll write a quick post it note for that page - knowing I can come back later and work in it properly. I have done this with conversations, dreams, random thoughts and quotes - it helps build the eclectic nature of a daily journal. This is something I really love; the random - in the moment - parts of life being captured. The only deadline I give myself - other than completing it by the end of the year - is monthly updates on my blog. This way, I never fall too far behind as I have to have it ready to photograph and post around the end/beginning of each month. Again, some months are busier than others so I do give myself a rough weeks leeway for this. In 2016 I had a manic end of the year so posted updates under seasons such as “spring” or “November/December”. I really think that since I have started this practise of (let’s call it) almost-everyday-journaling, I have dealt with things in my life better. I find art journaling so cathartic but I really do struggle with the journal part. It is so much easier for me to either just focus on patterns, colours and shapes, or on feelings from years ago - wounds that have already healed for example, are much easier to think about and dissect than fresh ones. Committing myself to keeping an art diary means I have to think a bit more about what is happening right now. No matter how tough it can be. During these two years I have experienced all manner of unhappy things, from grief to illness, uprooting, arguments and much more in my life. Subjects that are hard to go through and hard to translate into art. But there is always fun, adventure and lightness to be documented too. This is what gives a daily art journal it’s depth and variety; the change from one page to another. The focus on the un-extraordinary, the snippet of time that it captures for you. This year I was very happy that other people also wanted to create in this way! I am proud to have inspired some of my art journaling friends and love to see their updates and how they approach the idea. 2018 is fast approaching so if you’ve ever thought of trying to document your life through art, or would like to after reading this article... please join us! We use the tag #mydayarted on Instagram and it’d be great to see the daily art movement grow next year. Julia is a textile designer by day, and art journaler by night, based in the north of England. She started her blog julestea a few years ago and updates it and her Instagram regularly with art, travel and ..... more art! EXPLODING STARS SUPPLIES: Washi tape, Watercolour paint, White and black pen. ELEANOR MCCOMB Elly is an artist living in Sydney. Her life is loosely organised chaos, which is largely reflected by her art. BACKGROUND: I made this based on a tutorial by Get Messy artist Katie. It was so much fun to just paint without having to think too much about the outcome, and without having to come up with the idea. I love galaxies, they are a huge part of my illustration work, but this was a lot looser and more fun than that. MICHELLE SANDERS Michelle is a small town girl from South Louisiana who lives in her sleepy little home town of Plaquemine. She has been married for 15 years to the sweetest man to walk the earth, and blessed with two wild and crazy boys ages 6 and 11. Michelle has been attracted to all things paper crafts from a very young age...back when scratch and sniff stickers, peal and stick photo albums and scotch tape were acceptable. Although she loves making scrapbook layouts of family memories, she also loves working in a planner, making mini albums, and has been finding a lot of joy in art and bible journaling. She hates her handwriting but forces herself to use it more and more... hoping that maybe the children and grandchildren will appreciate it one day. BE THE CHANGE SUPPLIES: Watercolour paints, Maya Road spray mist ink, ZIP journaling pen, Staz on Ink Pad, Sassafras letter stickers, Water colour papers. ON THEIR HEART I WILL WRITE SUPPLIES: Watercolour paints, Spray Mist Inks, Zig Pen, Watercolour Paper. SARAH RONDON Sarah lives along the Hudson River in southern New York State, an hour north of New York City. She is constantly inspired by, and fascinated with, the contrast between the vibrant city and the picturesque Catskill Mountains. CONNECTIONS SUPPLIES: Watercolour paint, White gel pen, Alphabet stamp, Black ink. MELISSA PARTRIDGE Melissa lives in a world where every day is a creative, magical adventure full of colour! Art came into her world full time after being laid off from her corporate job in January 2012. After her Father’s death in 2013 Melissa started painting, art journaling and playing with mixed media as a way of healing. When Melissa is not creating you can find her at the local art museum, thrift store/ flea market or riding her bike to Plum Island Beach in Newburyport, MA. SUPPLIES: Watercolour paints, Water, Metallic markers. Rebecca is a multi-passionate creative with a background in fashion and a love of design, collage, art journaling, photography and textiles which all serve to inspire and inform her art. Constantly inspired by the natural world around her - her garden, birds, the weather and the Scottish landscape - Rebecca loves to ‘get messy’ with all of her supplies and let the medium inform the result. She’s recently embarked on the world of surface pattern design and can’t get enough of it! She also drinks a LOT of tea. HOLE IN THE HEART SUPPLIES: Faber Castell Watercolour pencils, Gelatos, Crayola markers. CARDELIA HOWELL-DIAMOND Cardelia is a Minister, mother, wife, writer and creative soul living in north Alabama, with a soul that refuses to leave west Texas! THROUGH THE FOREST, PAST THE TOWER SUPPLIES: Cotman Ivory Black, Dr Ph. Martin’s Iridescent Calligraphy colours Copper, Nib pen, Sumi brush, Old book paper, Collage. Clare is a Brit living in America. She live in St Louis, Missouri and has done for the past 15 years. She tries to create every day whether that be by art journaling, writing or making. IF YOU MADE A PROMISE, YOU MUST KEEP IT. SUPPLIES: Windsor and Newton Paynes Grey, Cotman Ivory Black, Dr Ph. Martin’s Iridescent Calligraphy Colour in Copper, Sumi brush size 8. ROBYN WOOD Robyn is a mixed media artist and rubber stamper living in Brisbane, Australia. She enjoys all types of paper crafts, and has a keen interest in photography and social media. Robyn enjoys sharing her skills and knowledge and loves playing with different ideas, techniques, new products and her favourite – rubber stamps! Robyn’s style is quite eclectic and often depends on the media she is using, but a strong feature in use of colour and texture. Robyn has had the honour of sharing her projects via design teams and by teaching stamping and mixed media in a local paper craft store. FIND YOUR WAY SUPPLIES: Darkroom Door – Discover stamp set, Numbers border stamp Watercolours, Ranger Distress Oxide Inks, Acrylic paint. FAREWELL DAD SUPPLIES: Watercolours, Washi Tape, Black and white photo copies, Thread, Modge podge, Salvaged words (release) from Colleen Attara; Artist. MELISSA PARTRIDGE Melissa lives in a world where every day is a creative, magical adventure full of colour! Art came into her world full time after being laid off from her corporate job in January 2012. After her Father’s death in 2013 Melissa started painting, art journaling, playing with mixed media as a way of healing. When Melissa is not creating you can find her at the local art museum, thrift store/flea market or riding her bike to Plum Island Beach in Newburyport, MA. MAGICAL ADVENTURE SUPPLIES: Darkroom Door - Fine Flowers Vol 2 stamp set, Butterfly Post Collage stamp, Paris Postcard Eclectic stamp, Large Mesh stencil Watercolours, Gesso, Gel medium, Dina Wakley Scribble Sticks, Ranger Distress Oxide Inks. ALLIE KENNEDY Growing up in the Pacific Northwest and now living in the Puget Sound, Allie has always been drawn to vibrant colours that are inspired by nature. Living in Portland, San Francisco, and now outside of Seattle, she is drawn to the intersection of nature, technology, and science. She wants to explore ways that these subjects can be portrayed through art, using different mediums, including watercolour, liquid watercolour, raw pigments, fluid acrylics, as well as various collage elements. How can all of the new technology, science, and rapid change going on all around us every day be communicated in different, new ways? Can art be used to create conversations and communication in these areas? AERIAL LINES SUPPLIES: Watercolour, Liquid Watercolour, Salt, Painters Tape, Fluid Acrylic. AMOEBAS SUPPLIES: Watercolour, Salt, Liquid watercolour, Fluid acrylic. METEOR SHOWERS SUPPLIES: Watercolour, Liquid Watercolour, Salt, Painters Tape, Fluid Acrylic, Gold Leaf, Gel medium. Fairy tales from long ago in a “land far, far away”, often include royal characters, fantasy creatures like speaking animals or other magical helpers, that are defined as good and evil characters. They also include a conflict that has to be solved. By changing one or more of these common elements you can modify the story and give it a new twist - and this is what I like to call a fractured fairy tale. The options are endless. What if Red Riding Hood and the wolf end up being best friends, Rapunzel decides to cut her hair or Sleeping Beauty wakes up before the kiss? Fractured fairy tales are very popular with authors and filmmakers. Most common are feminist twists because women are often oppressed and portrayed as weak in the original fairy tales. You might know Angela Carter who, in her anthology ‘The Bloody Chamber’, wrote different short stories based on fairy tales, but with strong female characters. Also, in many new movies the fractured fairy tale formula has been used. For example, Snow White and the Huntsman, Tangled, Hansel and Gretel: Witch Hunters, Maleficent and many more. Acrylic paint Magazine images Tissue paper Water colour Embellishments like lace Thread and Alpha stickers. Here are some ideas for how you might like to retell a fairy tale. »» Write the story from a different point of view. What does the villain think? How does he feel? Do the animals have something to say? Think of the Disney movie “Maleficent” in which we get to see the other side of the story, or “Wicked” that tells the story of the Wicked Witch from the West. »» Tell the story of another character. What life dreams does the Fairy Godmother have? Does she like her job? How did she even get the role? What secret life do Cinderella’s stepsisters have? »» Rewrite the ending. You don’t like the ending? Change it! What if Belle wants her beast back? Can she undo the spell? »» Change the gender. What if Rapunzel is actually a man with a long beard? »» Mix two fairy tales. Let characters from different fairy tales meet. Or let your character go through another fairy tale story. What if Peter Pan eats the poisoned apple and loses his ability to fly? Poor guy! Think of “Into the Woods” or “Shrek” where many classic characters make an appearance. »» A different conflict. Often it’s the princess that has to be rescued, but what if it’s the knight (or dragon!) who has to be rescued by a brave princess? »» Changing ethnicity. In “The Princess and the Frog” the race of the princess has been changed to African-American. This doesn’t happen often! Changing the ethnicity can give you the opportunity to include different symbols or cultural details. »» Another location/time. As we know, fairy tales take place far, far away and a long time ago. But what if the tale takes place in our modern times? What would that look like? Snow White working on a farmer’s market, allergic to apples? Think of the ‘Once Upon a Time’ series or the movie ‘Enchanted’ where the princess ends up in New York City. »» Continue the story. What happens after “the end”? Happily ever after can be a long time. What real world problems do they have? Is their love meant to last? Is Cinderella annoyed by her prince who leaves his socks everywhere? Do some princesses need post traumatic care and help? As you can see, there are many possibilities for rewriting fairy tales, but keep in mind that the origin of the fairy tale still needs to be recognisable so that the audience is able to see the variation, otherwise the fracturing doesn’t work. Once you have your story you can start to think about putting all this into a visual context. Start to collect ephemera and images that convey your changed story line, or portray your changed elements, but also think about colours. Is your twisted story darker? How can you convey that with colours? It is up to you if you want to include your story in your spread. You could include it on your background as journaling, or leave it completely without text, only showing your story with images. In one of my spreads Mirror, Mirror on the Wall, I portrayed the evil Queen from Snow White. I made a transfer directly on the background and built everything around her. The mirror doesn’t show the beauty but the character. What if the Queen looks into the mirror and doesn’t see her outer beauty but her inner ugliness? Would she change her behavior? The most interesting villains are the ones that aren’t just bad but vary in their shades of grey. I like to think that the Queen may not change completely but would find revelation, realisation and an awakening when she looks into the mirror. In another spread about Red Riding Hood being the villain of the story, I used a packing tape transfer to include the woods in the background. I imagined that she takes all the wolves in the forest hostage and only one is left, feeling alone and searching for his companions. Basically I turned the wolf into the Last Unicorn and Red Riding Hood into King Haggard. Another example deals with the ending of the Little Mermaid. The original ending is pretty dark and sad. So after she’s been dumped by the Prince, the little mermaid is destroyed and heartbroken. She lost so much - her voice, her family and her home, and she realises it has been a silly thing to give it all away for one person. But that doesn’t mean it has to be the end. She rises from the ashes and returns to her life with a new purpose. She might not get back to her mermaid form but she’s alive, she is needed and she can change the world for better. Maybe she starts collecting plastic from the ocean, rescuing sea animals. She hasn’t a voice, but actions speak louder than words. And that’s what she does. Riet lives with her husband near the coast in North Germany where she enjoys capturing her memories in journals and albums. If she isn’t covered in paint and glue she writes stories or photographs the nature outside her door. She can mostly be found on her Instagram page. 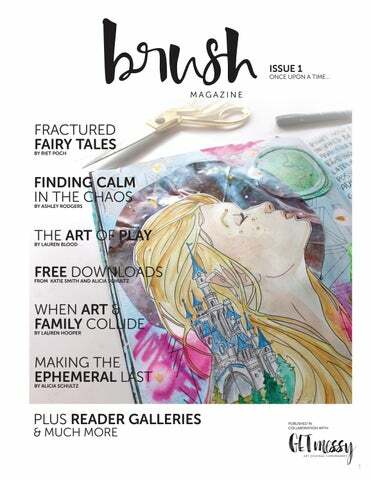 In keeping with the fairy tale theme for this issue of Brush Magazine, I asked the amazing Katie Smith to draw a fantasy elf girl that all of our lovely readers can download and include in their own art journals. As one would expect, Katie did not disappoint! This beautiful illustration is available from the Brush Magazine website where you can download her, and print her on paper or card stock and colour her in and include her in your journals. So here is how you get your download: »» visit www.brushmag.com/fantasy-elf »» enter the code FANTASYELF (all in uppercase) to access the page »» open the PDF link and save it to your computer »» print the file to the size you like »» make beautiful art. We would love to see what you make so please tag us (@brush_magazine and @studio.katie) and use the hashtag #BrushMagFantasyElf. We may even give you a shout out for playing along. ABOUT KATIE Katie is an artist and blogger located in Washington, USA. She loves anything and everything crafty - from scrapbooking and art journaling, to drawing, to quilting. When she is not creative, Katie is usually outside in nature, hiking or star gazing. THE PRINCESS AND THE PEA THE TRUE STORY. SUPPLIES: Staedtler Triplus Fineliners Water brush White and Silver Uni-ball Signo Gel Pen Pigma Micron Fineliners Sakura Gold Gel Pen Silk paper Doily Liquitex Acrylic Inks. JENNY SEHLSTEDT Jenny is an art journaler based in Gothenburg, Sweden. She discovered art journaling about six years ago but didnâ&#x20AC;&#x2122;t really actively start making pages regularly until the beginning of 2016 when she found Get Messy Art Journal. She love, love, loves layers and mixing different media. BACKGROUND: This page was quite painful to create. The most obvious fairy tale character that I am identifying with is the Princess and the Pea. I think she was a sufferer of fibromyalgia. When my body is in bad episodes I feel every fold and bump of the bed, my body is sore and stiff when I woke up. I do not feel rested. I need to remember then that it means that I am a princess - or rather, I am a princess regardless of how I feel. The butterfly symbolizes the fragility of my body, how easy I can cause bad episodes by straining myself. The rat, one of the worldâ&#x20AC;&#x2122;s most resilient animals, symbolizes how I keep coming up on top of it most of the times. The rat is also the mouse Reepicheep in Narnia, love his bravery and faith. I learned the technique of adding water to water based fiber tips from Julia Cusworth julestea.blogspot.com and her course Pen + Ink (available from getmessyartjournal.com/shop). My Staedtler Triplus Fineliners are now one of my favourite tools ever! The butterfly and the girl I traced onto silk paper and painted with those pens. Misty is ever-so-slightly obsessed with paint, glue, and paper. Her interests range across a variety of arts and crafts such as contemporary visual art, mixed media, book binding, crochet, and yarn spinning. When she isnâ&#x20AC;&#x2122;t in her studio slinging paint or gluing things together, she loves spending time with her family and her friends. ON A MOONLIT NIGHT SUPPLIES: Craft paper tag, Childrenâ&#x20AC;&#x2122;s primer image, Film negative, Magazine image, Scrapbook paper, Joss paper, Medical grid paper, Wire mesh image stamp, India ink, and Graphite. POMPEII FREE SUPPLIES: Gelli printed papers, Packing tape transfer, Doily, Postage stamps, Scrapbook paper, Correction tape, Tissue paper, Ink, and Coloured pencils. SUPPLIES: Black gesso, Gold ink, Found paper, Scrapbook paper, Gelli printed book page, Computer programming card, Marker, and Letters stamped with white ink. JENNIFER SHEPIT Jennifer Shepit is a painter who lives and works in the Pacific Northwest. Her abstract and figurative work explores interiority, shape, and narrative. She participates in local and online communities and enjoys bringing natural and urban experiential dichotomies into conversation. MEET ME IN THE SECRET PLACE SPRITE, FOX, MAGIC NEST SUPPLIES: Watercolour paint, Paper, Oil paint, Canvas, Linseed oil, Various brushes, White ink pen. JACQUELINE TORRES Jacqueline Torres, originally from Puerto Rico but living in Plymouth MA for the last 17 years, is a self tough artist who loves mixed media, art journaling, acrylic and watercolour painting. As a professional, Jacqueline works in science and biomedical technology research ... and that is why she needs art in her life. DEER FAIRY OF THE WOODS SUPPLIES: Wildflowers Stencil by Tim Holts, America Paint: Sap Green, Art Craft: Lime Green, Raw Sienna, America Brown, Art Infusion dimensional paint: bluesky, greenberry, seabreeze, Gold leaf Monalisa, #2 pencil, White Pen Signo, Script Stamp from my old stash. TRISHA LAMBI Trisha Lambi is an award winning artist known for her bold and lavish oil paintings. Of her work, Lambi says ‘Light and its effect on form is my inspiration and whilst I don’t particularly aspire to convey a conscious emotion in my work it seems to emerge of its own will’. She has exhibited widely in Australia and internationally. Highlights of her career include her selection to represent Australia at the 2006 and 2007 Guangzhou Art Fair in China and her selection as a finalist in the 2012 Art Taipei International Competition. She was a Zone winner in the London Olympics 2012 Art Show and was selected as one of the Best Picks for Painting in the 2013 Dubai International Emerging Artist Award. Her latest achievement is her selection as a finalist in the 2017 Corangamarah Art Prize and being named as a ‘Super Hot Artist for 2017’. An artist to look out for as her works continues to deliver a fresh perspective on contemporary oil painting. DYNA DAYS SUPPLIES: Oil on Linen. CARDELIA HOWELL-DIAMOND Cardelia is a Minister, mother, wife, writer, creative soul living in north Alabama, with a soul that refuses to leave west Texas! WHICH WOLF? SUPPLIES: Faber Castell Watercolour Pencils, Gelatos, Crayola Markers, Plastic bag, water, on watercolour paper, handmade journal. MICHELE DANIELS Hailing from Toronto, Michele spends her days either around books, makeup or art supplies. BEWARE THE JABBERWOCK SUPPLIES: Acrylic paint, Card stock, Clear rubber stamp, Metallic pens. JENNI ZMUDA WINGS Jenni lives in Michigan where she has too many animals and way too many art supplies - but is either really possible? She loves art. All kinds of art. But her heart is in art journaling. It’s so free and anyone, yes anyone, can do it! Jenni loves showing what she makes to others, helping them realise that they too can create art. Art journaling doesn’t have to be perfect or neat or tidy or really have any rules and that’s what she likes about it most. SUPPLIES: Roben-Marie Smith - PaperBag Studio’s Rubber Stamps Liquitex Acrylic Paint - Titanium White and Heavy Body Medium Magenta & Cadmium Yellow Liquitex Inks - Turquoise Deep Mermaid Markers - Siren, Byron Bay & Pirates Gold Heidi Swapp Circle Stencil Gelli Plate Shipping Tag Typewritter. Emma lives just outside of Manchester in the UK. She loves to be creative and loves being a member of the Get Messy Art Journal community. Being creative is the one thing she knows how to do and how to be so for her this is her safe and happy place and she adores it. FAT GIRLS ARE PRINCESSES TOO.... SUPPLIES: Black fine liner Thin marker Pencil colours. Inhale and exhale. Quiet your mind. Let yourself be still. My art journal is my still space. It’s a place for peace and a place for prayer. When life is hectic and the world seems a twisted mess, my art journal is my retreat. It’s the one place I know I can find peace. I have been art journaling for two years now. When I first started art journaling, I followed weekly prompts. I had found a lovely online community of women called Sisters with Heart in Art, and they created a space on Instagram to share art guided by weekly prompts. The prompts were simple, one or two words, and each person’s interpretation was mesmerising. I was amazed by the wide range of styles and skill levels, and the love and support I received pushed me to create. Every week I was excited for a new prompt, and I began watching art journal tutorials for various tips and techniques. I harvested stacks of magazines for collage material, chopped up piles of patterned scrapbook paper, and mixed paints I already had on hand. I’ve always been an artistic person, and this creative outlet fed my spirit in a whole new way. Eventually, I discovered Get Messy Art Journal, and decided to join during the Season of Introspection. It was during this season when I began to use my art journal to express my innermost thoughts and feelings. Not only did I experiment with different techniques, but I discovered a safe place to house my deepest thoughts and my darkest secrets. Even though Get Messy is a large community and there’s so much to explore, I didn’t feel lost. I navigated my way through the prompts and tutorials. Others who shared their work inspired me and gave me a huge boost with encouraging words and kind compliments. I poured out my heart page after page, and soon I began to develop my own style. Before I begin a page, I get still. I focus on my breath and decide what I need to say. I express myself with very few elements and a limited colour palette (usually black, white, and gold). Black and white is a classic pair after all. I love the visual contrast, and they represent two ends of the spectrum, dark and light. I embrace white space, because for me it’s important to leave room to breathe. When you’re plagued by anxiety or stress, it can be hard to catch your breath. Your stomach jumps hurdles. Your lungs get tight. Your heart pounds heavy. A crisp, clean background creates an open, airy feeling, and there’s instant relief. Gold is magic. I often use it to remind me of the light I have within me, shining eternally. It just adds that extra special touch, and I love the way it glistens and gleams. When processing my feelings and emotions, every page is a journey. The aim is to clear a cluttered mind full of tangled thoughts. We consume so much throughout our daily lives, and sometimes it can be overwhelming. I use a few go-to techniques in my art journal to release it all. Slow, repetitive tasks like cutting simple shapes, stamping letters one by one to fill a page, or writing a single phrase over and over can be relaxing. It doesn’t require much thought, and you are able to get lost in the process of creating. When your mind is quiet you can listen to your soul, and the beating of your heart will resound on every page. I also enjoy slow journaling. I first learned this hand-lettering technique from Tammy Garcia (Daisy Yellow), an amazing mixed media artist who inspires others to play, explore, and create daily. This form of writing helps you mindfully commit your thoughts to paper. As you focus your thoughts, you find clarity. Release the worry, doubt, and fear, and let go of your frustrations. As soon as you clear out negative thoughts, positive, empowering ones can enter. Sometimes the simplest pages have the most impact. Over time, I have developed a set of personal symbols, and there are recurring themes in my work. Wild scribbles appear often in my journal to represent chaos or confusion. I’m also drawn to birds and butterflies and rivers and streams. I use feathers to represent flight and ascension, and butterflies represent grace and freedom. All these elements bring me peace, so it is natural for me to include them in my art journal as I seek serenity. I strive to find balance and harmony in life and in my art. When the waves push me over and pull me under, I surrender myself to the page. I art journal to find my center and stay afloat. It helps me see the bigger picture and keep life in perspective. I take note of the light rays of sunshine peeking through on a cloudy day. I record the sweet sound of birds chirping on an early Saturday morning. I’ve learned to cherish these little moments and I’ve found a way to capture them on the page. Now I not only live, I breathe. SUPPLIES: Watercolour, pen, collage material, stamps and ink, washi tape, and embroidery floss. Ashley has always had a passion for art. She earned a BA in Art History from the University of Virginia, and enjoys scrapbooking, sewing, and art journaling. She became an avid art journaler in 2015, and now she serves as a 2017 Creative Team member for Get Messy Art Journal. Ashley believes itâ&#x20AC;&#x2122;s important to listen to your inner self and follow your dreams, and she hopes to inspire others along her artful journey. YOU’VE ONLY BEEN ART JOURNALING A RELATIVELY SHORT TIME, TELL US HOW LONG IT HAS BEEN AND HOW YOU DISCOVERED THE CRAFT? I started art journaling in April 2016. I always loved drawing and painting as a kid. I could spend hours and hours drawing princesses, my family and nature. However, I didn’t consider myself particularly talented in this area. I got good grades for drawing lessons at middle school and that was it. Despite not having a habit for drawing in my daily life, I have always craved more creativity. This is when I discovered the world of decorated planners. It seemed reasonable to me – I was combining practical use of planning with creative embellishments. I bought a ring planner and decorated some inserts for a month. Still, something was off, so I kept looking. INTRODUCING SASHA ZINEVYCH Sasha is a twenty-something freelancer. She works from home, so is free to choose where she lives. She is from Ukraine, but has been living in Poland for a year now. Sasha is inspired by European architecture on a daily basis. Her first hobby was photography and she still adores it. Fun fact: her full name is Aleksandra and nobody from non-Ukrainian and non-Russian speaking world can understand – why and how! But that’s really how you shorten her full name in her native language. One day, browsing Pinterest, like you normally do, I stumbled upon a beautiful mixed media page. I followed the link to the source to see the author of this beauty and ended up on Get Messy Art Journal Instagram page. To cut a long story short, I re-purposed my regular notebook to be my art journal and made my first art journal page that same day. And the rest, as they say, is history. TELL US WHY YOU ART JOURNAL. DO YOU CREATE BECAUSE YOU LIKE ART, OR DO YOU LIKE TO TELL STORIES, OR EXPRESS YOURSELF? I don’t think I have one clear answer to this question. I create because I feel the need to. It’s like there are all these ideas, and inspiration, and images boiling inside me and I just need to give them life outside of my head. I would say I am still struggling with going deep in my art journal. For now, it’s just a visual and creative release. Although, I am striving to be more expressive and conscious with what I create. There are some great art journalers, such as Vanessa Oliver-Lloyd (@dansmoncrane) and Molly Anthony (@mkranthony) whom I admire for the stories and feelings they bottle up in their art. EXPLAIN YOUR ART JOURNALING PROCESS, INCLUDING TECHNIQUES AND THE MATERIALS YOU LIKE TO USE. I don’t have a set procedure for my art journaling. Usually I either have a certain idea or a certain technique I want to try. My pages often start with inspiration – a film, a photo, music, a book/quote, an Instagram photo from my fellow art journalers or other awesome creatives I follow on this platform. I am not very good at thinking strategically in terms of the placement of art elements, or developing the page concept beforehand. I usually create as I go. I slap some acrylic or watercolour paint on the page and I cover it with collage (or vice versa). I add marks with markers, gel or brush pens. I love finishing off with some gold, white or black ink splatters. This all happens in one continuous process. I just let the inspiration flow through me and onto my art journal page. More often than not, I add words that are inspired by what the finished piece looks like. Although I am not particularly in love with my handwriting, I love writing my quotes with a brush pen. It adds softness and personality to the page. Another favorite is writing the quote on a piece of paper and then cutting each word separately and gluing it to the page. It always adds some character and structure to the spread. TELL US ABOUT YOUR FAVOURITE ART JOURNALING SUPPLIES. WHAT DID YOU START OUT USING? Funnily enough, I started art journaling pretty much not having any supplies for art journaling. I had a Honey watercolours set I used to paint with in middle school and a few cheap brushes. No special journal, no acrylics, no ephemera and, no inks. If you asked me about gesso at that time, I would have stared at you blankly. This goes to prove that you absolutely don’t need to have many supplies to create. For the first half of a year I was creating in a school notebook with regular thin paper. I bought myself a set of 12 small acrylic tubes a few months into art journaling. I made use of some hair chalks I had laying around and some awful thick gooey old gesso I managed to find in a Ukrainian store. I definitely have more art supplies now, but I still try to avoid buying things I am not sure I would use. I love my White Nights watercolours, budget friendly acrylics, a few water-based inks, and old magazines I use for ephemera. I recently tried gouache and I love the matte look it has. Oh, and I am a big lover of gesso now since I tried the proper, soft and smooth one! It lets me not fuss too much about the journal choice (I still cannot find the perfect one). I just buy the best journal I can find in an art store and then coat its pages with gesso for more durability. AS A BUDGET ART JOURNALER,, HOW DO YOU FIND ALTERNATIVES TO SOME OF THE POPULAR AND EXPENSIVE SUPPLIES? Definitely. Currently, I cannot afford expensive art supplies, I don’t have access to many artist quality brands, and I do believe you can create more with less. Here are a few tips: »» Go for the best quality you can afford. Be honest with yourself – if you are on a tight budget, no matter how tempting those Liquitex heavy body acrylics look (I know they do! ), they are not worth you feeling guilty about spending so much money on them. Decide what you can spend on your art supplies, and go for the best quality that money can buy you. »» Do your research. Some of the most premium brands can have cheaper copies. For example, when I was looking for alternatives to my 20 year old Honey watercolour set, I read many articles. A lot of people were making swatches and comparing Windsor and Newton, Daniel Smith watercolours to White Nights. Living in Ukraine at that time, White Nights, which is a Russian brand, was a far more accessible and cheap choice for me. I am very happy with these watercolours! »» If you cannot find/afford something, make it yourself. Of course, it cannot be applied to all art supplies, however, it is quite achievable in the ephemera, embellishments, and stencil department. Print your own ephemera (there are tons of freebies online), cut your own stencils out of card stock, and paint your own collage material. WHO ARE YOUR FAVOURITE ART JOURNALERS? Oh, it’s a tough question because I have so many! A huge part of my inspiration comes from Get Messy Art Journal community. Each and every artist there is full of creative ideas and encouragement. I highly recommend checking #getmessyartjournal hashtag on Instagram! Cait Sherwood (www.cait-makes.com) and Alicia Schultz (www.vineandthistle.com) are two of my all-time favourites. There are many fantastic artists outside of Get Messy community too of course. I absolutely love Tina Berning (www.tinaberning.de), Eva Magill-Oliver (www.evamagill-oliver.com), N J art (@nastejune), Jennifer Orkin Lewis’ illustrations (augustwren.com) and many others. WHERE DO YOU GET YOUR INSPIRATION TO ART JOURNAL? Instagram is my go-to place to get inspiration: from crazy talented members of Get Messy Art Journal community to all artists, florists, travellers, photographers sharing their work. Another favorite is, of course, Pinterest. Just type in “art journal” in the search bar and you will have hours and hours of inspiring content to look through. However, don’t forget to look for inspiration offline too: colours in your city architecture, clothes patterns, textures in nature, street art. I get massive inspiration in music, classic art, and movies as well. TIP FOR ART JOURNALING ON A BUDGET I cannot find vellum in Poland for the life of me, so I recently discovered the magic of tracing paper. I first heard Courtney from @littleravenink mention that she paints her own collage papers and I immediately knew it was something I could implement in my own art. I’d like to show you a few ways you could use tracing paper as a cool transparent layer in your art journal. SUPPLIES: »» Tracing paper »» Gouache / acrylic paint »» Brush »» Brush pen. To create your own semi-transparent collage materials, you just need to take a piece of tracing paper and get creative with it. Take a pen or a brush pen and script some text on your tracing paper. You can layer that sheet over your background later. Take a tube of gouache or acrylic paint and start painting on your tracing paper sheet. Try simple brush strokes, circles, crosses, plus signs, triangles, dots. If you take a smaller brush, you could draw various designs for a more intricate effect. These papers look awesome on their own or layered on top of each other. Putting good into the world makes me feel good about myself. Being positive isn’t always easy. I have my days of being a grouch. I can Oscar it up with the best of them. As I start to get sick of my own grouchiness and realize I have to turn it around, I deliberately make an effort to practice kindness to others. Doing for others takes me out of my trash can and into the wider world. I lighten up, my grouchiness starts to disappear, and I start feeling better about myself. Giving allows me to connect with people. It takes literally seconds to tell the person handing me my milkshake at Jack’s that I love her hair, but she will likely remember it for the rest of the day. It might take me 15 or 20 minutes to make a batch of postcards to send to a fellow Get Messians, but I’ve seen it bring so much joy to the people receiving them. I try to spend 30 minutes once a week going through the current Get Messy hashtags on Instagram to comment or just leave an emoji. I especially like to look for makers on the hashtags who only have a few likes and leave them an encouraging comment. My comment might be the one that determines whether or not they decide to make again tomorrow. Enthusiasm for other’s success is contagious for me and for others. Joining with people when there are things to celebrate or mourn allows me to really see people, even if it’s only a glimpse of one part of their life. Seeing them is the first step to loving them. Loving is connection. When I am empty people show up. My perfect storm of projects and life events has made it so I haven’t had the energy to do a lot of connecting activities. I haven’t been active on Instagram or the Get Messy forums much. I’ve been frantically working on these outside projects as opposed to working on my Season of Fairy Tales journal. But in the midst of that, people show up with kindness. I’ve gotten notes and packages from fellow Get Messians in the past couple of weeks. People have asked about my upcoming show. They’ve had words of encouragement as I’ve worked on the pieces for the show and expressed how meaningful the project is to them. All of these little things pile up into something that looks a whole lot like community. If you are on the fringes and are struggling to figure out how to engage in a community, try taking Tony's advice. May you find it has some of the same benefits for yourself and the communities you are involved in that I’ve enjoyed over the years. Misty Granade is ever-so-slightly obsessed with paint, glue, and paper. Her interests range across a variety of arts and crafts such as contemporary visual art, mixed media, book binding, crochet, and yarn spinning. When she isnâ&#x20AC;&#x2122;t in her studio slinging paint or gluing things together, she loves spending time with her family and friends. NEVER ENDING TANYALEE KAHLER SEA OF STARS Tanyalee Kahler is the editor of Brush Magazine. She is a passionate art journaler SUPPLIES: Golden High Flow Acrylic paint in Quinacridone Magenta Liquitex Acrylic Ink in gold Posca Paint Pens in gold, white and black. who has been a member of the Get Messy Art Journal community almost since it first began. She began with a minimalist approach to art, but as time has gone on and she has taken more classes, her style has developed. She loves to get messy with paint on her hands and is the teacher of the Get Messy Art Journal class, Messy Pages. This 3-inch accordion-fold journal is part of a series of exploring the overlap between our internal and external worlds. High flow paints move like water, creating organic shapes with intense hues. I keep stacks of painted circles and cut them, embellish them with patterns, and layer them to create an almost sculptural piece. These paints and simple patterns help me explore the intersection between the beauty in nature and art. I teach these techniques and how to weave more art into your everyday in a class called Fluid Art. THE WORLDS WITHIN SUPPLIES: High flow acrylic paint Gel pen Mixed media paper. DRIFTING WORLDS SUPPLIES: High flow acrylic paint Gel pen Mixed media paper journal. ADVICE TO OTHER JOURNALERS My best trick as an artist is to strike a balance between a willingness to let my art journaling be primal and expressive, and practicing skills so that I have the â&#x20AC;&#x153;vocabularyâ&#x20AC;? with which to translate what I want to say with my art. AMY MARICLE Amy Maricle is an artist and art therapist who lives and works in South Eastern Massachusetts. She is the founder of http://MindfulArtStudio.com and teaches classes on art journaling in a playful, intuitive way. Her students value her mindful, non-judgmental approach and fun techniques for setting aside the inner critic in favour of their authentic creative voice. CONVERSATIONS SUPPLIES: I use a “hand book” journal, small about 6x6” square. My materials include gouache, tempera, ink, pen, collage with hand painted paper and other collected ephemera, tape transfers, fabric, gold leaf and the occasional glitter. A sharp pair of scissors and acid free glue are at the ready as well. INGRID ELLISON Ingrid is a painter and arts educator working in oil, mixed media and print making living in Camden, Maine. Born in Boston, Massachusetts. Ingrid’s earliest memories of Maine were floating aboard a little sloop amidst the fog and rocks of the coastline during family vacations. Since moving to Maine in 2007, Ingrid has exhibited at the Center for Maine contemporary Arts, Aarhus Gallery, AVA Center for the Arts, Cynthia Winnings Gallery and Frank Brockman Gallery. Ingrid has a passion for sharing what she does with the greater community and makes connections with students both school aged and adult. Ingrid is a graduate of Skidmore College and earned her MFA from American University. As an undergraduate she spent a year print making at Il Bisont in Florence Italy. A consummate learner, Ingrid has participated in residencies and workshops at the Vermont Studio Center, Maine College of Art, and castle Hill Center for the Arts. ARTWORK BY SASHA ZINEVYCH ‘A Little Magic’ Sasha is a freelancer from Ukraine, currently living in Poland. She discovered art journaling a little over a year ago and it has been her creative outlet ever since. Sasha is a happy member of the Get Messy Creative Team 2017 and is blown away by the community every day. Robyn is a mixed media artist and rubber stamper living in Brisbane, Australia. She enjoys all types of paper crafts, and has a keen interest in photography and social media. Robyn enjoys sharing her skills and knowledge and loves playing with different ideas, techniques, new products and her favourite – rubber stamps! Robyn’s style is quite eclectic and often depends on the media she is using, but a strong feature in use of colour and texture. Robyn has had the honour of sharing her projects via design teams and by teaching stamping and mixed media in a local paper craft store. SUPPLIES: Darkroom Door – Stars stamp set Scratches background stamp Lindy’s Stamp Gang watercolour powders & sprays, Clear embossing ink, White embossing powder, White Sharpie paint pen. SAFRANA MUSA As an artist, Safrana describes her style as quite boho and her work reflects the colourful freedom and flow. She loves using patterns in her work too. START THE DAY WITH STARS SUPPLIES: Watercolour Inks Gold glitter stars. TELL US A LITTLE ABOUT YOURSELVES? DID YOU ADD TO EACH OTHER'S PAGES OR STICK TO YOUR OWN? (KATIE) I’m Katie, an artist and blogger located in Washington, USA. I am into everything creative, from drawing to scrapbooking and everything in between. My greatest inspiration is nature and outer space, both of which I love and work into my art regularly. (RIET) I’m Riet, living in North Germany with my husband and tons of hoarded papers. I enjoy capturing my memories and feelings with paint and words and making a mess in my art space. I also love reading, photographing, nature and a good chocolate cake. (RIET) We added to each other’s pages, after all that’s the best part of a collaboration. Being able to not only learn from the other, but to combine your art with the art of someone else is when the real magic happens. Sometimes it depends how much the other one has already worked on the pages. Like in my journal I painted a complete page of the lake and the swans, and all Katie added were little flowers. Sometimes there is only space for little details to add, other times there is a greater combination of both styles. TELL US THE STORY OF HOW THIS JOURNAL CAME ABOUT. HOW DID THE STORY LINE COME ABOUT? (KATIE) I actually contacted Riet because I had been wanting to do some sort of art collaboration with her for a while. I didn’t know what theme/project I wanted to do exactly, but I loved Riet’s magical work, and she was inspired by my girl drawings so we quickly decided on a storybook with a fantasy theme that focused on girls. (RIET) We both decided on a rough story line -a plot- before we started. My story is about a girl born with swan wings and thus lives at a lake; Katie’s is about a girl that went into a forest and never returned. That’s pretty much all we set up, it’s good to leave room for the story to evolve and not being so tight on a story line. Journaling isn’t Katie’s force so she didn’t do much of that while I tend to write too much sometimes. She’s very good at illustrations while I try to be good at them! LOL. My point is: we were able to balance each other out and contribute our strengths. I added more journaling, Katie added more illustrations and it complemented each other. Collaborations always change my art just a little bit. When you’re working in just your own journal, you finish the entire spread yourself, however with this collab journal, I tended to leave spreads more unfinished, in hopes that Riet would add her own artistic touch to them (which she did, and I LOVE). HOW LONG DID THE COLLABORATION TAKE TO COMPLETE AND HOW DID YOU APPROACH IT? (KATIE) We each started our own journals so there were two of them, which took about four months to complete, from January-April 2017. I live in the USA, while Riet lives in Germany, so to save on postage, we only swapped them back and forth twice: I sent my storybook to Riet for her to work on while I added to hers, and then we sent them back so that we each ended up with our original journals. WHICH IS YOUR FAVOURITE SPREAD IN THE JOURNAL? (KATIE) It is so hard to choose a favorite, but I’ll try! In my storybook, my favorite spread is probably the ‘Daughter of the Forest’ spread (see page 58). I love the vellum flaps, and then Riet’s girl drawing with the forest animals in her hair. I want to be that girl. (RIET) I totally see you as that girl, Katie! I basically love the entire journal but one page really makes my heart sing every time I see it. It’s a page where I attached a flap in form of a wing and other than that I left the page pretty untouched. What Katie did there was pure magic. She drew the swan girl with her winged arms. When you open the flap it looks like she’s opening her arms, ready to fly. It’s perfect (see page 61). DESCRIBE YOUR JOURNALING PROCESS, THE TECHNIQUES AND MATERIALS YOU USED. (KATIE) These journals are very mixed media and have a combination of paint, collage, sketches, gelli prints, and more. My go-to techniques though are drawing and watercolouring. I’ve found that painting in my sketches with watercolours gives them a dreamy look that I love, and they fit really well into these fantasy storybooks. (RIET) Since it has a fantasy/whimsical topic I like to include interactive elements like flaps, windows or vellum. Those are the first things that I planned. From there I started to collect papers and ephemera that fit my colour palette and my general ideas. Here I went with a dreamy light pink, gold (after all she’s kind of a princess), different shades of blue and a bit of green. All colours that you would find at a lake. CAN YOU GIVE OUR READERS SOME TIPS ON WORKING COLLABORATIVELY? (KATIE) If you want to start a collab journal, the best way to go about it (in my opinion) is simply to ask an artist you admire if they would like to work on something with you. As an introvert, approaching someone is hard for me, but I’ve found it really fun as an artist to work collaboratively. When collaborating, don’t be afraid to leave empty places in your work for your partner to fill in, and at the same time don’t be scared to work on top of their art as well. That’s what makes collaborations magical, is the combination of two styles. If you’re working with someone who lives in a different country, remember that the postage will add up, so decide how much you’re willing to spend and that will determine how many times you swap them back and forth. (RIET) Like Katie said, be brave and ask someone to collaborate with you, but also keep your eyes open! Often people who want to collaborate make an announcement in forums or Facebook groups, asking for contributors! If you like them, be brave and apply! Communication! Communication is everything! Make sure you plan how to approach the project together, keep the other updated with how far you are, if you need more time, when you send things off. Make sure you both communicate if you want to create a hashtag (ours is #KandRstorybook), show peeks or everything else in between! Don’t be afraid to ask questions twice when you aren’t sure! A collaboration is meant to be fun and a wonderful experience, communication is a great help to make sure of that! Stay confident! You are worthy and your art is enough. When we work with someone else we are even harder on ourselves. We don’t want to mess things up. We want to create good art for each other and that can be intimidating and a lot of pressure. It is important to always remember that you have a unique gift and talent that will contribute to the journal. Katie is an artist and blogger located in Washington, USA. She loves anything and everything crafty- from scrapbooking and art journaling, to drawing, to quilting. When she is not creative, Katie is usually outside in nature, hiking or star gazing. Riet lives with her husband near the coast in North Germany where she enjoys capturing her memories in journals and albums. If she isnâ&#x20AC;&#x2122;t covered in paint and glue she writes stories or photographs the nature outside her door. I’m writing this article as a kind of welcome to Brush Magazine, but also as an introduction of what else I have planned. And I’m going to throw in some publishing tips along the way. Now on to a slightly more serious topic, and I don’t want to spoil the enthusiasm for this little venture, but we need to talk about copyright. Copyright is a tricky subject when it comes to publishing art. Particularly when we are talking about a worldwide magazine being published by an Australian. Many of you won’t know this, but I have been a Graphic Designer for ten or more years and throughout my whole career it has been a dream of mine to publish a magazine. I have been involved in many large publications, but nothing with the time frames and content collection such as a magazine. As I mentioned in my Editor’s note, I was sitting on my couch one day pondering where my art career, and my design career, were headed, and the thought that had been in the back of my head forever surfaced. I realised I could merge the two together and design a magazine about art journaling. I raised the subject with the Get Messy Art Journal creative geniuses Caylee and Lauren and things have moved like a freight train ever since (completely of my own doing of course). 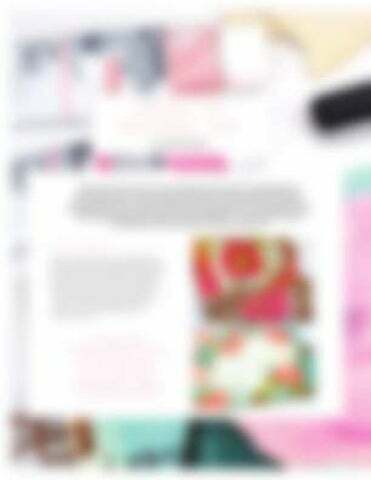 THE VISION The plan for the magazine will be for it to be aligned with the Get Messy seasons. 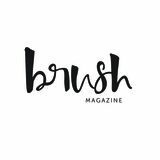 So soon after the new season is announced, so will the submission call out be announced for Brush Magazine. But that does not mean that the content will only be about Get Messy. My vision is for the magazine to bring together ALL the art journaling communities and provide amazing artists all over the world with a place to share their work, and get the recognition that they deserve. Brush Magazine will never be an exclusive publication. If you take the time to submit your work, then I will do my very best to publish it (disclaimer: read the information about copyright below). It may not be in the actual magazine: it might be through social media, or even on the blog, but I am all about building communities, building confidence, and celebrating all artists. Most people would be aware of the basic copyright rules that are simple enough in that you cannot use someone else’s work and call it your own. You can’t create a direct replica of an artwork and claim it as your own – that is common courtesy. But did you know this also extends to using magazine clippings in your artwork? Now this is not something I had considered myself as I was under the impression that because the clippings were being treated differently to their original purpose, then it would be okay. But unfortunately, according to Australian Copyright Law (which is what I need to abide by), I am unable to publish artworks containing magazine clippings unless direct approval from the original publisher is obtained (i.e. the magazine you cut them from). Unfortunately, this meant that several artists’ works were not published this issue and I had to disappoint people. So, if you are considering submitting your work in any future issues of Brush Magazine, please keep in mind the use of magazine clippings, and perhaps contact the publishers of magazines you frequently use to see what their thoughts are on the issue, and whether they would consider granting permission to publish. LET ME KNOW WHAT YOU THINK With all that said, I hope that you have enjoyed this issue of Brush Magazine, and that you will continue to support us in the future. If you enjoyed what you have seen, please send me an email (hello@brushmag.com), I’d like to include a mailbag section in the next issue in celebration of all that has been achieved. Stay tuned for an announcement about the next issue and its theme for galleries and feature articles. I look forward to my inbox once again filling up with your inspiring art. I am very aware of just how daunting the blank art journal page can be. When I first started art journaling I was paralysed by the blank page. That is until a season of Get Messy Art Journal about two years ago when Vanessa Oliver-Lloyd (@dansmoncrane) introduced the Get Messy Game. It was a series of posts on Instagram with a new step for an art journaling page each day. The game lasted a week and resulted in some really beautiful, yet extremely different interpretations of the steps. I thought it would be a fitting way to finish this first issue of Brush Magazine, by giving you all a recipe to make a full art journal spread. This opened up a whole new world for me. I took that game and made it my own by having a jar of techniques on my art table that I can pull from when I feel paralysed. I call them my Messy Pages Recipes. Random recipes, but recipes none-the-less. Please Note: I was going to include a photo of my page, but thought I would leave you to work without influence. I will share my work on Instagram though, so be on the lookout. So without further ado, here is the first of many Messy Pages Recipes for you to follow.  Share your resulting page with us on Instagram and use the hashtag #BrushMagazineRecipe so we can all see your work. Step One: Choose three pieces of ephemera (this could be magazine clippings, tissue papers, gelli prints, watercolour backgrounds, anything) and glue them onto your page. Step Two: Choose some paints (any kind - watercolour, acrylic, ink - whatever) and put it on your page. Blending it into the edges of the collage ephemera your have already applied. Step Three: Write some journaling on the page. It can be legible, or messy writing that only you will know the meaning of. Step Four: Add some illustrations or marks to the page. This is where your imagination should start taking off. The marks or illustrations can be intuitive marks, or they can have a purpose and be related to your journaling. Just go with the flow. Step Five: Choose a magazine clipping that ties your page together. This could be a model that is expressing your thoughts, or it could be florals or any other image that resonates with your spread. (Beware of those pesky copyright laws though if you intend to publish your artwork somewhere). Step Six: Finish the spread with ink splats or meditative dots. around the world who have experienced trauma. Get Messy partners with Art Feeds who provide creative development and emotional expression through art and community by providing free therapeutic art and creative education programs. Join Get Messy or take a course with us and be a creative hero. Alicia Schultz talks about flowers and how they are nature’s form of art: the vibrant and soft colours, the beautiful lines, the imperfections. Yet, their beauty is fleeting. They take your breath away only to fade a short time later. They are temporary, and once a particular type of flower has finished blooming, you wait another year to see them again. For me, the passing of time is quick when keeping track with each blooming flower. I have this desire to take the ephemeral beauty and make it a little less temporary.